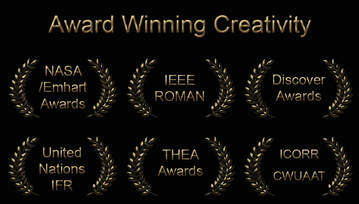 A few examples of who has awarded, published and/or presented our R&D. MRISAR's R&D Team consists of four family members who have designed and created the prototypes of every robotic, science, tech art and regular art exhibit that MRISAR sells and rents. The members are MRISAR's Founder John Adrian Siegel, his wife Victoria Lee Croasdell, plus their two youngest daughters Autumn Marie Siegel and Aurora Anne Siegel, (who started helping with R&D when they were preschoolers). MRISAR’s goal in creating so many products is to fund their own Philanthropic R&D projects and programs. Although each member is a core Artist/Engineer/Inventor, they have their own interests that they merge with MRISAR, resulting in a diversity of creativity! This team has even invented robotic systems for NASA. In order to help fund our philanthropic R&D work we began designing, fabricating and selling our own hand made robotic, scientific and artistic creations to museums worldwide. Our product line is a result of the incorporation of some of our own R&D technologies. Our Humanitarian & Environmental Research & Development has been presented before and/or published and awarded by: the United Nations, NASA-Emhart, Stanford, Cambridge, ICORR Robotics conferences, ROMAN Robotics conferences, IEEE, Discover Awards, International Federation of Robotics, etc. Our 1990's circa, original innovative R&D in "Facial Feature Controlled Technology" and "Artificial Sense of Touch Technology" (Adaptive Technology prototypes for the disabled), has helped pioneer those fields! We were the only company in the world to be awarded an entire chapter regarding our work in the International Federation of Robotics (IFR) “World Robotics; Service Robotics publication, 2011”.